There are so many scooters out there, I decided to do some research to find out about the top 5 scooters for 2016. I just recently bought myself a brand spanking new Razor A5 Lux Adult Kick Scooter. Yes I did! My kids like to go up to the school parking lot every day after school and ride their scooters around. Usually by 4:00 or so all the cars have left, so we have this giant arena for riding scooters. I would always casually stroll behind them watching them have so much fun on their scooters. Often times, I would “borrow” one of their scooters and race around the parking lot until they would say “Mom…can I please have my scooter back?” After a few weeks of this, I realized that it was time for Mom to get her own scooter. How else was I to keep up with them! And…I wanted to have some fun too! So I logged on to Amazon and bought myself a scooter. A pink one! The original kick scooter just got a whole lot better, making it even more fun for kids and teens alike. Though it’ll never replace the internal combustion engine, the Razor A3 will get your child from point A to point B much quicker than on foot alone, and requires just a few scoots of one’s shoes in the process. Plus, it’s a blast to use, as your progeny will likely attest. The Razor A3 is made of aircraft-grade aluminum, a sturdy material that holds up to use and abuse through the years. Razor combined the traditional aluminum construction, however, with a number of recent innovations, including a springless shock-absorbing system that makes bumpy pavement feel smoother than ever and an all-new wheelie bar that guarantees an extra dollop of fun. Add in such details as 125 mm urethane wheels, ABEC-5 high-speed bearings, a patented rear fender brake, and a patented folding mechanism and you have a great kick scooter for virtually any situation. This version of the Razor A3, which supports up to 143 pounds and is recommended for ages 5 and older. In my mind, this is just a simple, classic kick scooter. It’s an upgrade from the one I used to own – same design, but it’s just been improved. You can’t go wrong with this model. If you’re looking for a great, solidly constructed scooter that will last you a very long time, then this is the one for you. In fact, I still have my original Razor scooter that I bought back in college (a long time ago). My kids ride still ride on it. It is in great condition, but it is now covered in stickers! As you can see from the picture, we all love scooters at this house. Often times, my driveway looks just like this, but with even more scooters from other children on the street. They dump their scooters right at the front door while they are off playing kickball or football! Fuzion introduces the beginner PRO scooter for younger riders to perfect scooter tricks. Fuzion PRO X-3 comes in 5 vibrant colors to style up your rider along with lightweight box-shaped deck design for smooth grinding. The scooter also features high-strength handlebar with comfort rubber grips for our palms. The Fuzion PRO X-3 is the perfect gateway to advanced riding while enjoying the Fuzion quality and design to enhance the performance and riding experience. This sounds like the perfect scooter for someone who is just starting to get into doing tricks on their scooters! I mean, how can you lose for this price? And…lots of colors to choose from. In my little bit of time at the skate park, I have seen several of these. This scooter, because of it’s price, might be a good place to start! Extra-large urethane wheels make the Razor A5 Lux kick scooter an extra smooth ride. Easy to fold and ready to go, the A5 Lux has a super strong aluminum t-tube and deck to comfortably support riders up to 220 lbs. 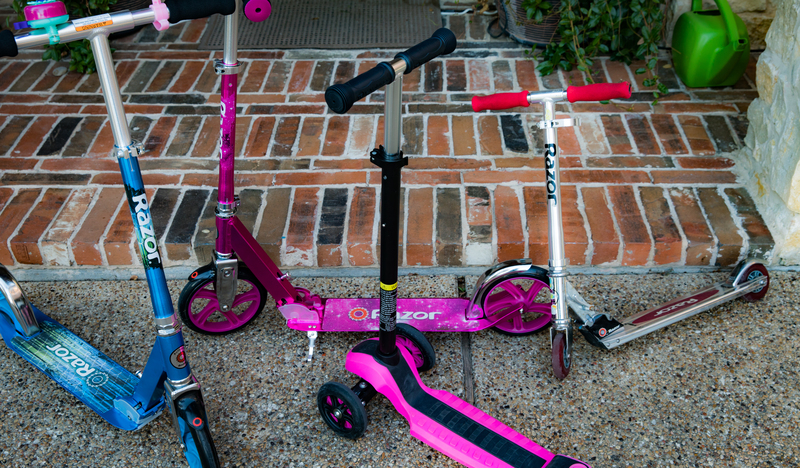 My daughter and I both have one of these scooters – I have a the pink one, and Morgan has the blue one. We LOVE these scooters. The think I like best about mine is the larger wheels. I was always getting “tripped” up on small bumps or rocks in my path on the regular Razor scooters – maybe because I was too heavy for them. But with the A-5 Lux, I glide easily over bumps and rocks. Now this is not a “trick” scooter (or maybe it’s me that can’t do the tricks), but for riding around and chasing your kiddos, this is the perfect scooter. “Lean to Steer” technology allows the rider to easily control where and how he or she rides Reinforced riding deck features built-in grips for safety Stopping is simple with the rear-wheel braking system Handlebar adjusts to your child’s height and features comfortable rubber grips Two-toned front wheels and an extra-wide rear wheel provide a smooth ride for your little one Recommended use: up to 88 lbs. My daughter received this scooter for her birthday last year. She was having trouble on a 2-wheeler, so a friend recommended this one. It was amazing. Suddenly, she felt secure enough to race up and down the street with my son. She was so happy – she never lost her balance, and it was very easy for her to steer. I highly recommend this scooter. In fact, my son often hops on it too – he says it’s a great scooter even if you already know how to balance on a 2-wheeler and steer. And…it comes in pink, so Morgan was thrilled! We have many scooters in our garage, and Morgan still gravitates to this one most times. She can zoom really fast on it, and balancing on it is so easy. As is steering! If I had known about these when she was a little bit, I definitely would’ve bought one much earlier than we did. Fuzion Z375 Redefines Performance. The totally new for 2016 Fuzion Z375 is the ultimate Pro Scooter. Everything about the Z375 is built for performance. Wider + longer deck, CNC head tube cut out together with Fuzion’s CNC forged aluminum fork the Z375 comes with NECO Integrated and Sealed Headset Bearings. The Z375 comes fully loaded to meet the demand of the most serious advance rider. If you are a technical rider looking to shred every rail and ledge you come across the Z375 is the Scooter for you. With the Fuzion’s unique Dog Bone deck and neck design impact forces are evenly distributed around the decks outer surface making this one of the toughest and lightest decks around. Our 3 degree top and bottom concave deck design delivers added landing stability and makes for super smooth grinds. Fuzion’s neck tube uses the same Dog Bone extrusion design plus it is internally reinforced for added strength and the Dog-Bone designed deck side rails allows for easier grab tricks. Now to me, this sounds like a pretty serious trick scooter! A bit out of my league for sure, but this is the kind of scooter my son wants. Right now, he still rides his Razor Kick Scooter, but I think it’s about time for him to upgrade. A few more visits to the skate park, and I’m not going to have much of a choice. He’s starting to ride up the sides of walls, jump curbs, and do spins in the air. I think this type of scooter is the next logical step.